In any shop, there is a range of risks that could pose a threat to your customers, staff and assets throughout the day. As every business owner is aware, a lot of time, dedication and hard work is necessary to successfully run a company, which is why many shop owners choose to protect their financial security by taking out business insurance. If you are a retailer, specifically shoe shop, purchasing shop insurance can help provide protection and security for you and your premises, employees, customers, contents and stock. During your search for a shoe shop insurance package, you are likely to be offered several key elements of cover that will comprise your shop policy, alongside optional covers, helping you customise your cover to suit your specific needs. Before committing to buy, make sure you fully understand the risks you’re going to be protected against, as well as taking into account any exclusions that may apply. Depending on your policy wording, contents insurance can provide cover for both the contents of your business premises – such as counters, shelving, display units, electronic equipment and machinery – as well as commercial stock like footwear, shoe-care products and accessories. It is worth noting that if you rent the premises, some things like counters, shelving may be insured by the landlord. It’s worth checking, as you can always buy tenants improvement insurance too. You might want to purchase separate business equipment insurance if you use specialist equipment and tools in your shoe shop – for example for shoe repairing apparatus, or for electronics such as computers and cash registers. Stock insurance is not always included as standard, so it’s worth making sure that you have the appropriate cover, as there’s a good chance you’ll be keeping a large volume of stock on premises. This can cover costs if your products suffer damage, theft or destruction. When calculating the value of your stock, remember that insurers will only cover the cost price and not the resale value of your stock. It is also a good idea to keep your insurer informed of any significant fluctuations in the value or quantity of your stock. You may also benefit from ensuring seasonal stock increase cover is included in your policy, to help cover the cost of increases in stock during your busiest times (such as in the run-up to Christmas Day). While not relevant for all shoe shop owners, if you sell custom-made or personally-manufactured shoes, you may benefit from product liability insurance. This form of cover can provide financial protection if a customer blames your product for causing injury or damaging them or their property. Product insurance may also be of value to you if you provide a shoe repair service to customers. A key aspect of shoe shop insurance package is public liability insurance, which can help defend against, and pay compensation for, claims made by the public if they’re injured or their property damaged while at your business premises. You can extend this cover to help protect against similar claims made by the public when you are working away from the business premises – this could be useful if you regularly attend trade fairs or exhibitions. Do I need public liability insurance? Click the link to find out. It’s a legal requirement to have employers' liability insurance in place if you have including contractors, employees, casual workers or temporary staff - whether paid or unpaid – however it is not required if you only employ family members. The cover can help meet the cost of claims – for example paying for a legal defence or compensation – made by employees who suffer injury or illness as a direct consequence of working in your shoe shop. If you employ a large number of workers, or have a high staff turn-over, you may also want to take out employee dishonesty insurance which provides cover in the event that one of your workers behaves fraudulently – for instance stealing money or stock. A successful claim on this cover can help recover any financial loss you may experience as a result of employee dishonesty. If you own your business premises, you could benefit from purchasing buildings insurance, which can help provide protection against risks such as damage and theft in respect to the main building structure – and its permanent fixtures and fittings. If you have taken out a mortgage on your business premises, your mortgage provider may insist that you purchase this cover. If you rent your shoe shop premises, your landlord is likely responsible for purchasing buildings insurance – but check with them to confirm this. As a tenant, it may be useful to purchase tenants improvements insurance if you plan to make changes to the fixtures and fittings of the building. This cover can help cover costs in the event of unexpected or malicious damage to your improvements. Regardless of whether you need to purchase buildings insurance, you might want to consider purchasing glass cover, or shop front cover, which can help cover the cost of repairing or replacing damaged windows, signage, window decals and the shop’s awning, which are often vulnerable to vandalism and unexpected strong weather. Business interruption insurance can help protect you against any losses you may incur as a result of being unexpectedly unable to trade. You may, for example, suffer the temporary breakdown of essential equipment, or loss of stock through fire, flood or other incident. 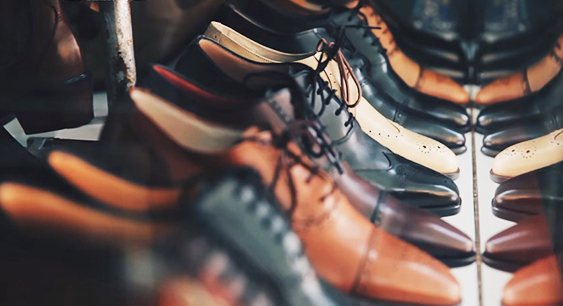 Multi-shop insurance: This form of cover can be valuable if you own shoe shops in multiple locations. Many insurers offer multi-shop cover, which allows you to protect multiple stores with a single policy. While it's easier to protect all of your premises with one policy, it's important to note that multi-shop insurance may not always be the cheapest option. You may find it more cost effective to purchase separate shoe shop insurance policies rather than a combined policy. Money insurance: Money cover can help provide financial assistance in the event of loss of business money due to theft or robbery. Money insurance can cover money stored in and out of safes and cash registers, and money in transit to and from banks. If you regularly transport your shoes, machinery or equipment outside of your business premises, it may be worthwhile purchasing goods in transit insurance which can provide protection against theft, damage and loss of items while in transit. If you use a separate courier to handle deliveries to your customers, they are likely to provide their own insurance – but it’s always worth checking. There are a number of options for you to choose from when taking out insurance for your shoe shop, and the exact composition of your insurance will depend on your store’s circumstances. No two businesses are the same, so no two shoe shops will have exactly the same insurance requirements. No matter how similar your shop may be to another store, there are almost certainly going to be differences. For example, the type of footwear you sell may differ in style, price or speciality – which could affect the exact wording of your contents or stock insurance. Similarly, there may be differences in location that could influence your policy, such as the volume of visitors that your shoe shop sees - or an environmental susceptibility to certain weather conditions. It’s always important to ensure you properly understand the extent of any cover that you take out, so that you can make sure you’re protected against relevant threats - and that you’re not leaving vital areas of your business exposed to risk. Running a thorough comparison of shoe shop insurance quotes can also help you ensure you're getting the best cover for the best price. To get a quote for your shoe shop insurance policy, call Make It Cheaper Financial Services. Our insurance experts can help you to make sure that you’ve got all the relevant cover in place - and provide you with a bespoke insurance package to suit your needs. Click the ‘get a quote’ button below, or call us on 0800 970 0077 today.